In March 2015, villagers from Mahazoarivo, Ampitanabo, Boribe, Antevamena and Analafaly participated in the reforestation of 2 ha of degraded land in newly protected areas of the Reserve west of Ampitanabo village. They planted 650 individuals, using cuttings of Commiphora sp. and Alluaudia procera. 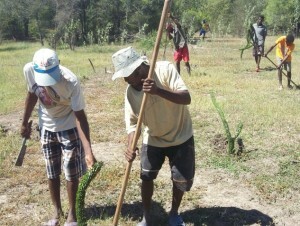 In addition, villagers in Bejio have planted about 100 cuttings of Commiphora and Alluaudia in a community lot, to serve eventually as a wood supply for siratany production. The monitoring team is monitoring the survival rate of these planted trees closely.